Each month we ask a soil researcher to select his or her favorite soil. Ir. Simone Marx from the national soil department of Luxemburg of the Ministry of Agriculture, Viticulture and Consumer Protection in Luxemburg chose the Vertisol. SM: I’m hesitating between sandy soils on the Luxembourg Sandstone (li2) and the clayic soils on Middle Keuper marls and dolomites (km), but my absolute favorite is a Vertisol on a dolomitic marls of the Steinmergelkeuper (km3). SM: Vertisol are not so common in our latitudes. The vertic properties we observe nowadays are inherited from the time these sediments were deposited in the Trias of Mesozoic Area. The main properties are the high content of clay (45-50 %), the shrinking properties of the mixed layered chlorite/smectite (20-25 % of clay fraction) leading in the late spring and summer to opening cracks and self-mulching on the surface. In the pit, you can observe slickensides and wedge shapes aggregates in the Bi horizon (20-80) cm. Because of the dolomitic substrate, pH is basic. pHwater ranges between 7,5-8,0 and available P, K, Mg concentrations are high. Water content at the wilting point pF 4,2 turns around 20% and reduces available water capacity. SM: The soil strikes already in the landscape because of the greyish and alternatively reddish colour of the geological material. 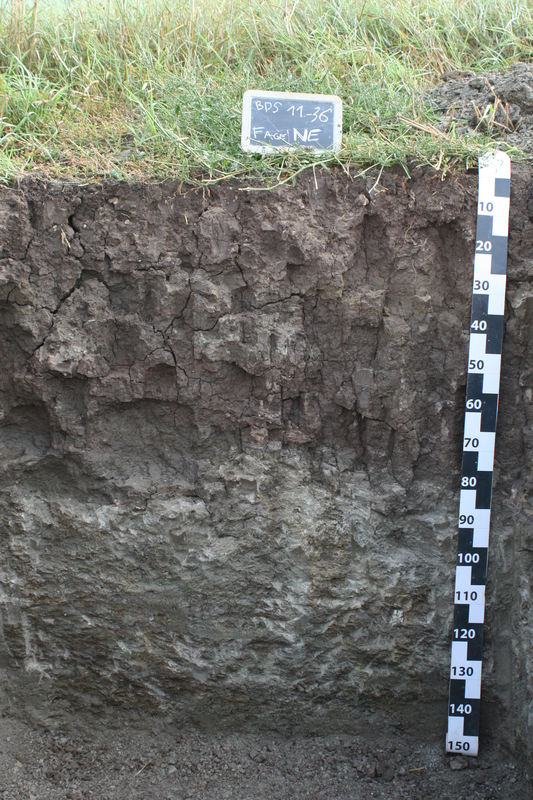 Most interesting thing of these soils is their strong structure: because of the shrinking and swelling properties, self-mulching on the 0-2 cm horizon, surface cracks and polygonal pattern of prismatic primary structure breaking into sharp angular blocky aggregate with wedge-shaped ends and slickensides, you literally can observe that the soil is a living body. 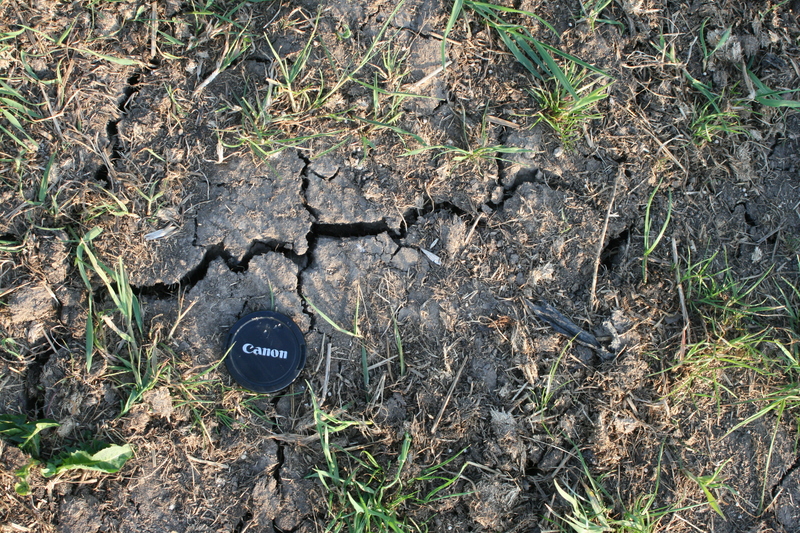 SSSB: Do the properties of this soil type have consequences for it’s management, e.g. in terms of land use, soil quality …? SM: yes, indeed in the first half of the last century, when agriculture was still more depending on the natural fertility of the soils, these soils led to comparatively good yields of wheat because of their naturally alkalinity. But, because of the high clay content, these so-called ‘Minutenböden’ require high skill in cultivation of land and tillage. Minimum tillage should also be best practice. Nowadays, water is pivot of productivity in agriculture and the specific moisture characteristics of these soils (high residual water content, limited water retention capacity) are limiting factors and a natural handicap in a changing world. Nevertheless they stay excellent pasture soils not in terms of quantity but in quality of grass because of high availability of P, K and Mg. Only weathering depth of 40-80 cm can lead to arable land, otherwise permanent grassland is best land use. Very shallow soils on steep slope, oriented south, lead to habitat of Festuco-Brometea. These soils produce also high mineralized wines and tasty fruit. They are eligible for the LFA, less-favoured areas, in Commun Agricultural Policy in Europe because of their clay content and vertic properties. SM: In 2011, we first opened a pit on Vertisol in Moesdorf on Steinmergelkeuper (km3), in the center of Luxemburg, and described it together with Jérôme Juilleret from CRPGL (today LIST –Luxemburgish Institut of Science and Technology). The SSSB visited it in May 2012, but weather conditions were so horribly that nobody could even enter the pit full of water. Therefore, we opened it again this year in spring for visiting purpose. The particularly dry weather of last months creates excellent conditions for seeing vertic structure and vertic properties. The pit will remain open till September 2015. Contact for visiting: simone . marx (at) asta . etat . lu (nvdr: without the spaces). 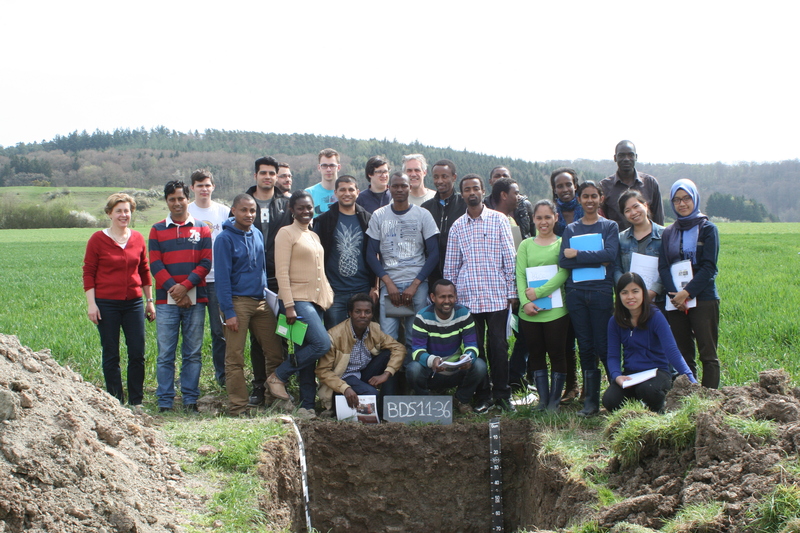 Peter Fink (UGent) visiting the profile in Moesdorf in April 2015 with a student group. The profile will remain open for visitors till September 2015. Ir. Simone Marx, national soil department of Luxemburg of the Ministry of Agriculture, Viticulture and Consumer Protection in Luxemburg. Simone Marx is head of the soil department since 2007 dealing with soil mapping, profile description, classification and soil analysis. She studied agronomy at the FUSAGX in Gembloux, where she came out with a specialisation in soil science in 1993. Until 2007, she worked for the Chamber of Agriculture in Luxemburg in the farming advice service. 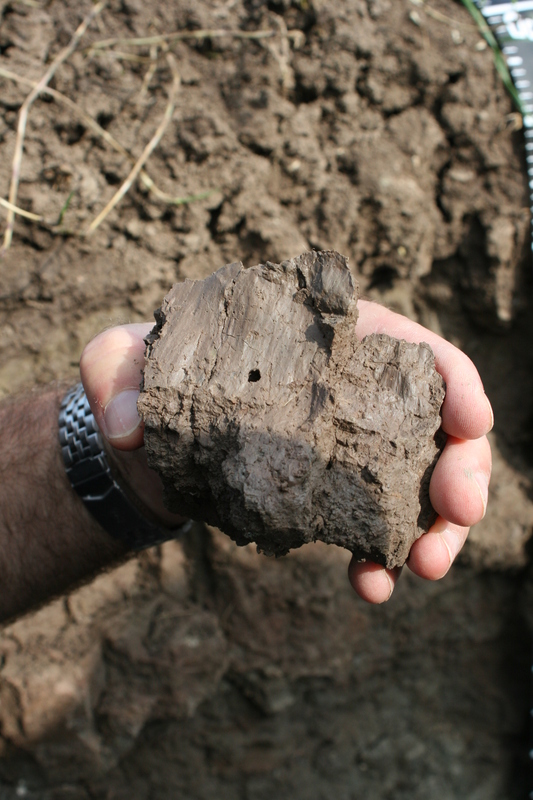 Since 2008, several research projects with LIST, UCL, Gembloux Agro-Bio Tech (ULg) as well as contact to belgian and international soil scientists let to a better characterisation, understanding classification and mapping of soils in Luxemburg.